You knew another one of these nights was inevitable, but you didn’t know exactly when the heat check would arrive. Well that night was last Thursday and unfortunately for host Sacred Heart, the Pioneers happened to be the opponent when Robert Morris senior guard Karvel Anderson (Elkhart, IN/Elkhart Memorial (Glen Oaks CC)) had one of those “can’t miss” type of games. How hot was the Choice Hotels/NEC Player of the Week? The Elkhart, IN native hit shots from every conceivable spot on the floor, making 15 of his 19 attempts, including 6-7 from three-point range for a career-high 36 points in a 79-70 win. His shooting performance was so impressive that it reminded Sacred Heart head coach Anthony Latina of another explosive scorer who often turned heads at the Pitt Center. Anderson’s night gave a new meaning to the word efficiency. Only two other Division I players this season have made at least 15 field goals in as few as 19 attempts from the field. 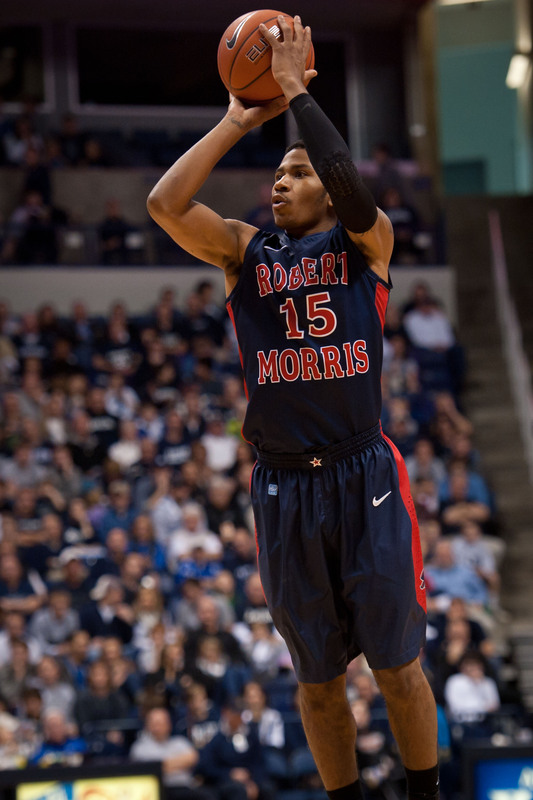 How does this performance rank with some of Anderson’s other white-hot nights in his two years with RMU? Judge for yourself. Anderson piled up 32 more points on Saturday in a 71-67 win at Bryant to give RMU a road sweep and leave the Elkhart, IN native with a ridiculous 34.0 ppg average on 64.3 percent shooting from the floor and 60.0 percent (12-20) from three-point range. Anderson is currently shooting a scorching 52.8 percent from the floor and 47.7 percent from three-point range on the season. He leads the NEC in both three-point accuracy and made trifectas (3.59/game), and ranks fourth in scoring (19.3) and field goal percentage.